Durable plastic is ideal for frequently referenced documents. Print the inserts using your laser or ink jet printer. Bigger tabs and inserts provide 50% more printing space for tab titles than traditional insertable tab dividers. Tab design allows for easy access to insert and remove tabs. 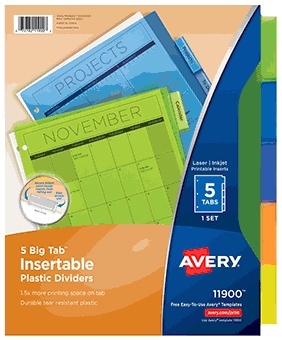 Avery® offers many easy-to-use design and print solutions for dividers.